Baldur was one of the most beloved of all the gods. The son of Odin, the chief of the gods, and the benevolent sorceress goddess Frigg, Baldur was a generous, joyful, and courageous character who gladdened the hearts of all who spent time with him. 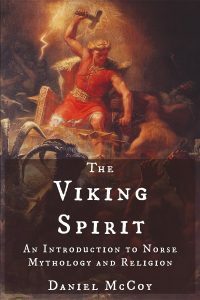 When, therefore, he began to have ominous dreams of some grave misfortune befalling him, the fearful gods appointed Odin to discover their meaning. Baldur’s father wasted no time in mounting his steed, Sleipnir, and riding to the underworld to consult a dead seeress whom he knew to be especially wise in such matters. When, in one of his countless disguises, he reached the cold and misty underworld, he found the halls arrayed in splendor, as if some magnificent feast were about to occur. Odin woke the seeress and questioned her concerning this festivity, and she responded that the guest of honor was to be none other than Baldur. She merrily recounted how the god would meet his doom, stopping only when she realized, from the desperate nature of Odin’s entreaties, who this disguised wanderer truly was. And, indeed, all that she prophesied would come to pass. Odin returned in sorrow to Asgard, the gods’ celestial stronghold, and told his companions what he had been told. Frigg, yearning for any chance of saving her treasured son, however remote, went to every entity in the cosmos, living or nonliving, and obtained oaths to not harm Baldur. After these oaths were secured, the gods made a sport out of the situation. They threw sticks, rocks, and anything else on hand at Baldur, and everyone laughed as these things bounced off and left the shining god unharmed. The gods found themselves unable to speak as they trembled with anguish and fear. They knew that this event was the first presage of Ragnarok, the downfall and death, not just of themselves, but of the very cosmos they maintained. At last, Frigg composed herself enough to ask if there were any among them who were brave, loyal, and compassionate enough to journey to the land of the dead and offer Hel, the death-goddess, a ransom for Baldur’s release. 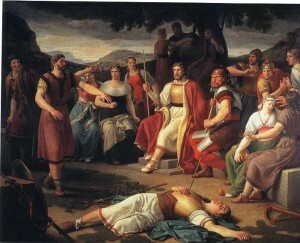 Hermod, an obscure son of Odin, offered to undertake this mission. Odin instructed Sleipnir to bear Hermod to the underworld, and off he went. The gods arranged a lavish funeral for their fallen friend. They turned Baldur’s ship, Hringhorni (“Ship with a Circle at the Stem”), into a pyre fitting for a great king. When the time came to launch the ship out to sea, however, the gods found the ship stuck in the sand and themselves unable to force it to budge. After many failed attempts they summoned the brawniest being in the cosmos, a certain giantess named Hyrrokkin (“Withered by Fire”). Hyrrokkin arrived in Asgard riding a wolf and using poisonous snakes for reins. She dismounted, walked to the prow of the ship, and gave it such a mighty push that the land quaked as Hringhorni was freed from the strand. As Baldur’s body was carried onto the ship, his wife, Nanna, was overcome with such great grief that she died there on the spot, and was placed on the pyre alongside her husband. The fire was kindled, and Thor hallowed the flames by holding his hammer over them. Odin laid upon the pyre his ring Draupnir, and Baldur’s horse was led into the flames. All kinds of beings from throughout the Nine Worlds attended this ceremony: gods, giants, elves, dwarves, valkyries, and others. Together they stood and mourned as they watched the burning ship disappear over the ocean. Meanwhile, Hermod rode nine nights through ever darker and deeper valleys on his quest to rescue the part of Baldur that had been sent to Hel. When he came to the river Gjoll (Gjöll, “Roaring”), Modgud (Old Norse Móðguðr, “Furious Battle”), the giantess who guards the bridge, asked him his name and his purpose, adding that it was strange that his footfalls were as thundering as those of an entire army, especially since his face still had the color of the living. He answered to her satisfaction, and she allowed him to cross over into Hel’s realm. Sleipnir leapt over the wall around that doleful land. And so Baldur was condemned to remain in Hel’s darkness, dampness, and cold. Never again would he grace the lands of the living with his gladdening light and exuberance. Simek, Rudolf. 1993. Dictionary of Northern Mythology. Translated by Angela Hall. 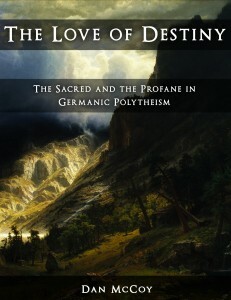 p. 159. Snorri Sturluson. The Prose Edda. Gylfaginning 49.